I’ve been having an ongoing conversation with my friend Cody about how much non-cooking stuff should be featured here at Idiot’s Kitchen. This is, after all, a cooking website/blog. I’ve tried to keep most of the posts (with the exception of a few cats) cooking related but this was JUST TOO COOL not to share. My family came to visit and we went to NASA! We all know about the beaches and the theme parks and the sunshine and the good winter weather and all the other reasons people come to visit Florida but I am here to tell you, the one thing you might not think about doing is the one thing you really should do. Go to NASA! 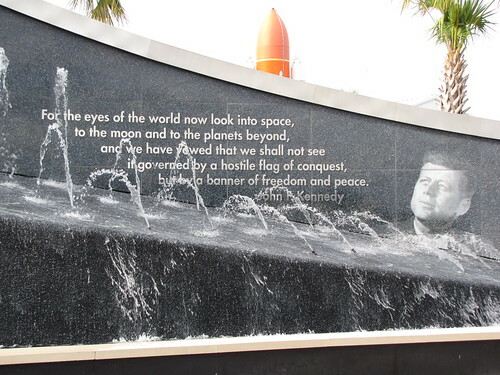 The Kennedy Space Center at Merritt Island, Florida is on the east coast of Florida. It’s about an hour from Orlando and an easy drive from Tampa where I live. When you go – notice I didn’t say if – plan to spend plenty of time there. We were there from about 10:30 am to 6 pm and didn’t come close to seeing everything. 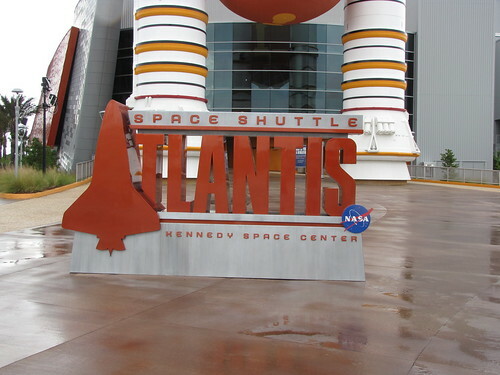 First stop, Space Shuttle Atlantis! 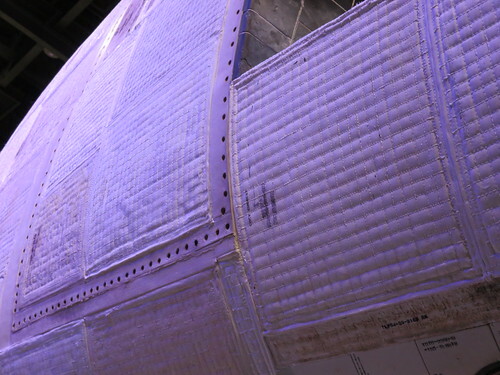 Yes, those are the actual fuel tanks for firing the shuttle into space. HUGE! Full disclosure: the photo below is a photo of a photo that hangs inside the Atlantis museum. Since the shuttles are all now retired, we obviously didn’t get to go to a launch. 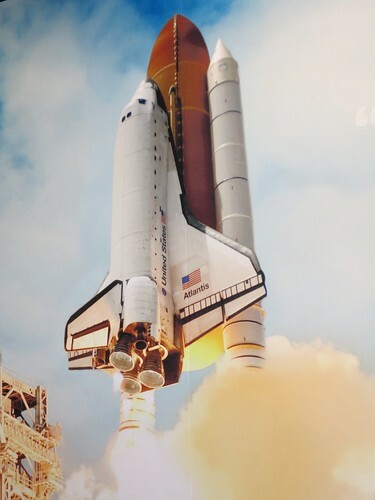 However, I can tell you that when the shuttles were flying, they used to come right over our house on their way to land at Kennedy Space Center. The sonic boom was amazingly loud. The one time Jim was home when the shuttle flew over, he ran outside thinking a tree had fallen on our house. Huge BOOM that rattled the entire house which is pretty impressive when you consider that houses in Florida are made out of concrete to be hurricane proof. One of the best things about the many displays at NASA is that they have movies, signs, interactive “games”, and features for all ages. Maybe really little kids would get tired but I think it is very well suited for all ages. 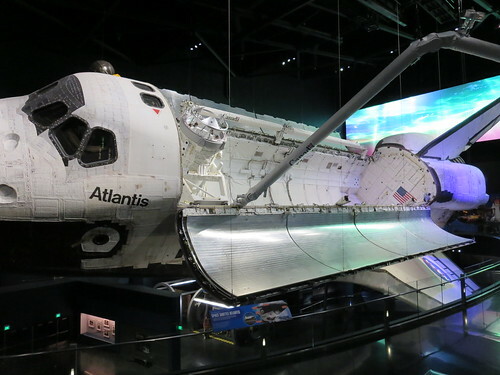 One tip though, if you are even slightly inclined to get vertigo, stand by the wall during the introductory movie for the Atlantis Space Shuttle. It’s an incredible film but there was one minute where my dad and I both almost fell over. That being said, that movie was probably my favorite thing of the whole day. I won’t spoil it for you but the ending is very, very cool. The pictures really don’t do this justice. 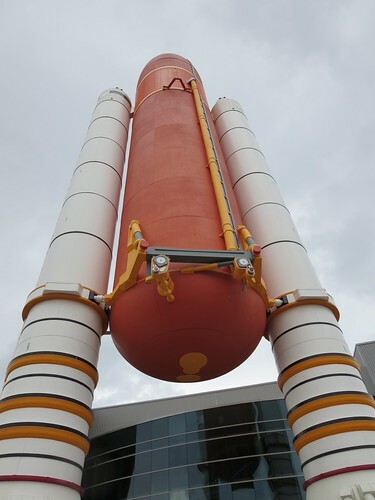 You can get very close to the shuttle to see so many amazing details. 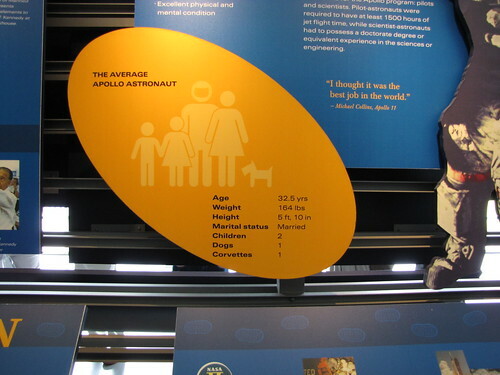 The floor below the shuttle has most of the interactive displays. Didn’t think this post would be about food? Wrong! How about a photo of the space station kitchen! 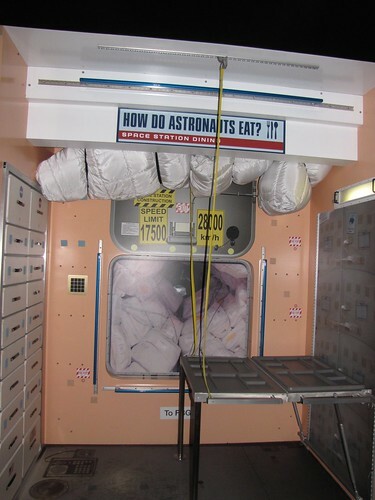 Food is stored in the little boxes to the left and then prepared eaten while all strapped down to the table on the right. You can’t have your dehydrated ice cream floating off in zero gravity. And, if you’re curious (I was not) they even sell dehydrated ice cream in the gift shop. I’ve done enough camping to know to avoid that. Speaking of food, after spending a couple of hours in the Atlantis display we were hungry. There are several restaurants on the property to have lunch. If you want to pay extra, you can make reservations in advance and dine with an astronaut. 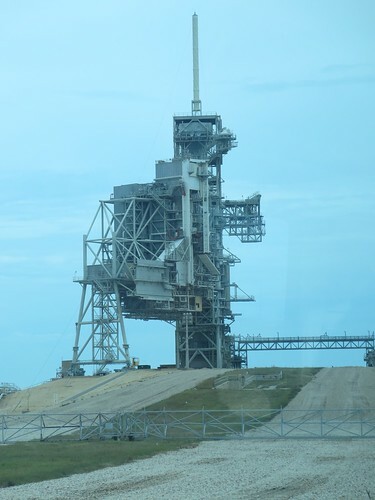 After lunch we hopped on a bus to tour the launch pads and areas not accessible due to security. The bus tour is part of the regular admission and makes stops along the way so you can take photos. 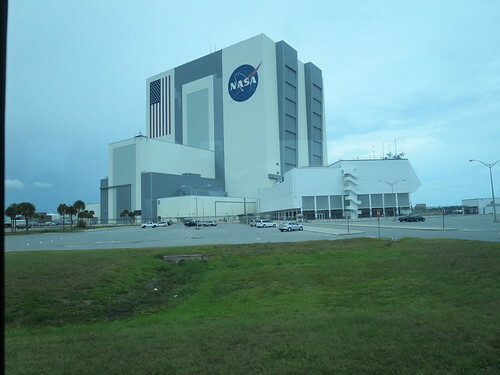 It was very neat to see the Vehicle Assembly Building in person and not just in movies. This building is so huge they have to have special climate control features so that clouds don’t form and cause it to rain inside. 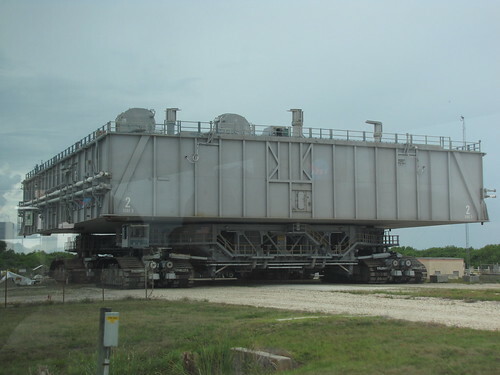 This is The Crawler (with the shuttle platform) that moved the shuttles or rockets from the Vehicle Assembly Building to the launch pad. The Crawler gets a whopping 32 FEET per gallon mileage. Launch Pad B. Those two things that look like roads with the grass in between is actually the path for the crawler. It’s that wide. 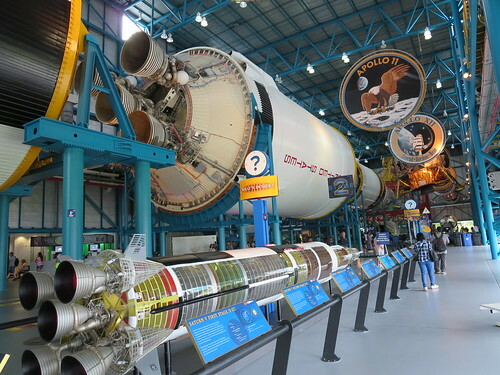 The bus tour eventually takes you to the building housing the Saturn V Rocket and dedicated to the Apollo Moon Missions. This thing is HUGE! 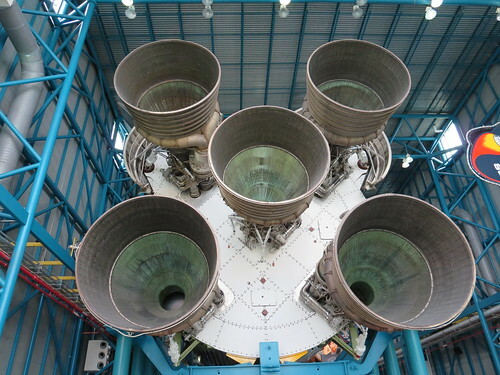 The Saturn V rocket is 363 feel long. That’s taller than 2 shuttles, 2 Statues of Liberty, and longer than a football field. 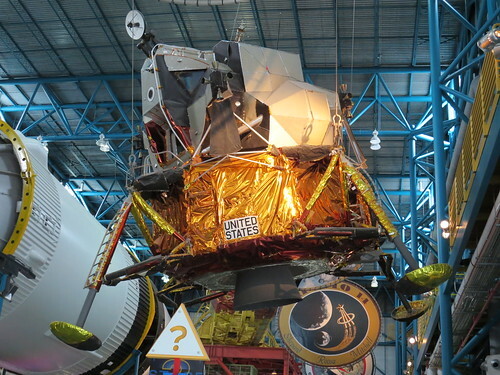 They have an impressive display of all of the components of the moon landings including the lunar module. We all agreed that this looks like something you would put together in the summer in your back yard out of scraps rather than sophisticated scientific equipment. 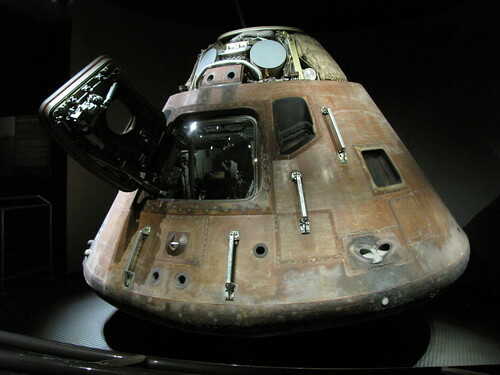 The Apollo 14 capsule, “Kitty Hawk.” I can’t even begin to imagine getting into this thing, hurtling through the atmosphere, and splashing down in the ocean. Imagine having to explain that concept to the astronauts when they first came up with the idea. Insanity. 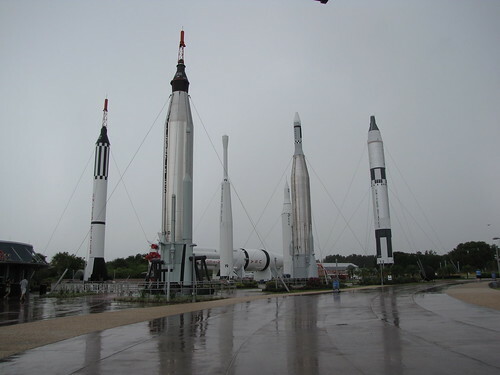 Outside is the Rocket Garden. I know I keep saying that things are amazing and awesome and unbelievable but they really are. You can walk around and get right up close to all the displays. 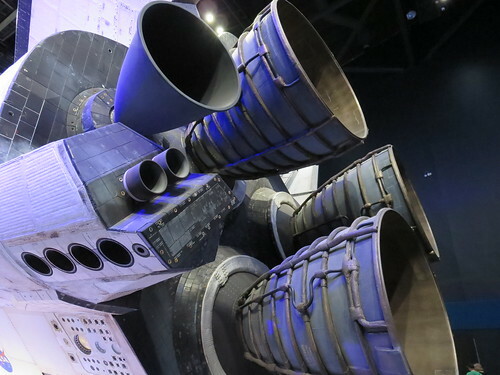 Kennedy Space Center was by far the favorite touristy thing that I’ve done since moving to Florida. We were there for almost 7 hours and saw most of the big displays but didn’t have time for the Astronaut Hall of Fame (you are allowed to visit that on another day with your same admission ticket), the iMax movies, or the Astronaut Memorial. 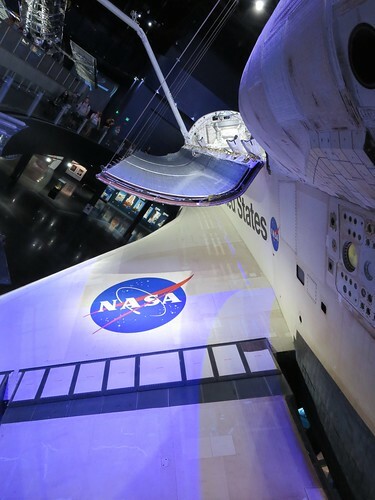 I highly encourage you to put NASA and the Kennedy Space Center on your travel agenda. If you live in Florida and haven’t been there yet, what are you waiting for? Bonus…it’s right by a couple of very nice beaches. And yes, we came home and watched Apollo 13…again. Love this. We’re all space nerds here! I love this post even without food or cats; you are so funny. The husband and I went there around 1989 or so. I’m wondering if much has changed? It was a cool visit for us and I really should take the girls there; I know Lolo would love it….Linds? She’d rather be at the beach. 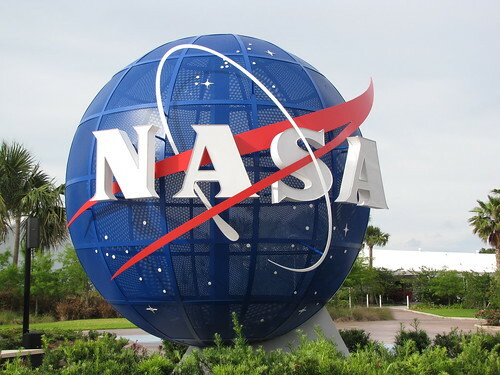 We were in Orlando last weekend and even discussed Nasa. Jeff said he thought they were shutting it down in the near future? Suz, you should definitely go back. 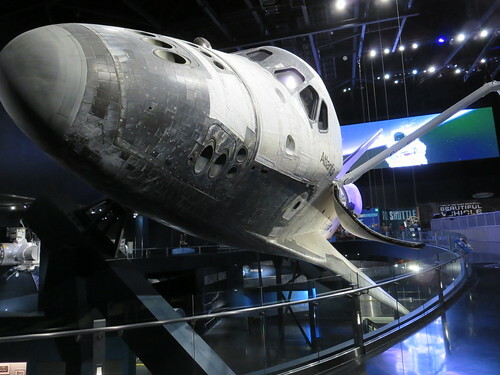 The whole Space Shuttle Atlantis display is new. It’s amazing!